All of our wonderful holiday properties featured below have achieved a 4 or 5 star grading and a Gold Award. We regularly inspect every one of our holiday cottages and look at a property’s services and facilities to give it an overall grading. We know how important your getaway is so we take the time to inspect every property to ensure it meets our Original Cottages quality standards to provide you with a quality cottage to relax and unwind in. Why accept anything less? Do you prefer a cottage beaming with character? We have a fine selection for you to choose from. Suffolk’s rich heritage and stunning architecture means we have been able to source some wonderful character cottages for you to stay in. Do you prefer a modern apartment with a striking interior? We have some fabulous modern holiday homes across Suffolk, including some that are situated in idyllic locations such as Southwold. 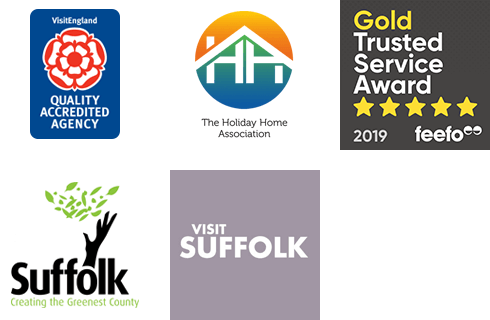 Whatever your preferred luxury; we have a varied portfolio of quality cottages to make your holiday in Suffolk memorable. What can I do in Suffolk? Suffolk benefits from offering such a variety of attractions, places of interest and fabulous towns and villages that there’s always plenty to enjoy during your stay. Whether your favourite thing is to blow away the cobwebs with a brisk countryside walk, bringing the family together for a beach break, or sampling the local delights in beautiful towns and villages, you won’t be short of things to do in Suffolk. To find out more, view our What's On Guide to see what’s happening during your visit. Don’t forget to give us a call as we’re happy to suggest our favourite things to do in Suffolk! Browse our collection of luxurious cottages across Suffolk below. One of the finest country houses in Suffolk, Worlingham Hall is boasts beautiful classical interiors. A Grade I Listed building, this property also offers a heated swimming pool, tennis court and parkland to enjoy.